Bathroom remodeling is generally not an easy process. Changing your premises’ parameters visually or in any other way makes it even more difficult. Your bathroom may be too small for you or, vice versa, way too big. In this case some corrections will help you feel more comfortable in your bathroom. It’s really easy to find a way out. You just need to find the exact factors causing your difficulties and add a couple of special steps in your bathroom remodeling planning accordingly. Sometimes it’s just impossible to do anything with your bathroom layout as it was originally built that particular way. The only way to improve the situation is installing new plumbing that will better fit in your bathroom in accordance with the current room features. Look at your items closely. 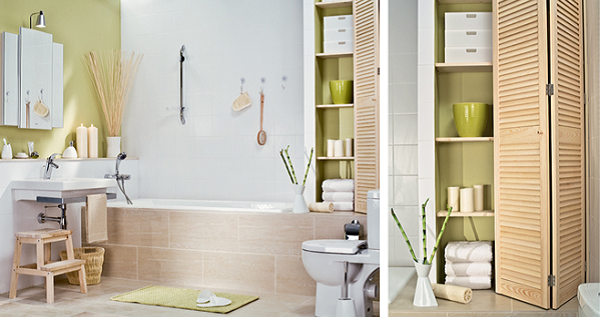 Sometimes, replacing big models with smaller ones makes it easier to move around your bathroom. If your bathtub size makes it difficult for you to move around your bathroom, we recommend you replacing it with a shower cabin. You won’t be able to enjoy laying in a bubble bath anymore, but you’ll be impressed with how helpful it can be for saving some space. Could that be a reason for all the inconveniences? If that was the case, it would be quite easy to solve this problem. You would simply change the location of all incorrectly placed items. We’d recommend you sketching a new bathroom design that would satisfy all your needs and requirements and then compare it with your existing bathroom design. You probably have a lot of things that you don’t really need in your bathroom. “Spring-cleaning” will help you determine which ones they are. Both problems can be easily solved. If you are an owner of a very small bathroom, then make sure to only place most needed items there. You can also visually enlarge it choosing the right color of your floor and wall tiles as some colors really have that special enlarging effect. This method is also applicable when it comes to a big bathroom. Correct material choice can also make it look smaller. If you got lost while making choices, please, call Miami Bathtubs! We’ll easily update your bathroom, reinstall your plumbing and provide you with the information on how to choose the right finishing materials. Welcome!